moe talks a lot: Happy St. Husbands Birthday! Today is Husband's birthday! I think we've officially gone through all of the (current) annual road markers as a married couple - just our anniversary left in less than a month! Wore this to church. I think I'm becoming a heels and lipstick girls - it's my current obsession, that'll change. I've realized that the best way to never look like a frumpy old (or middle aged) lady is to have a lot of styles that you love that you're always changing. Otherwise you become one of those ladies that are still wearing jeans from the 80's because they're stuck believing its the only thing that works on their bodies ...um, never want to be one of those ladies. Anyways, I digress. I love this jacket with the huge buttons. 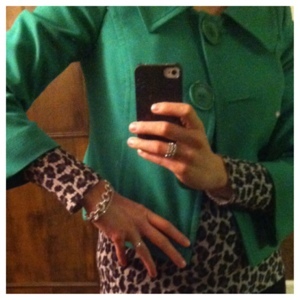 This is my first time wearing it with this leopard print sweater - I thought of paring this together a while ago but saved it for St. Paddy's day - there are only so many church appropriate green clothes I can wear! 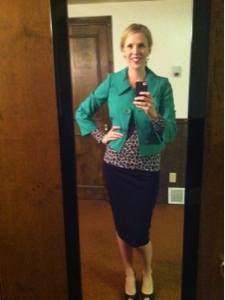 And if I didn't wear green I know husband would pinch me the whole time. 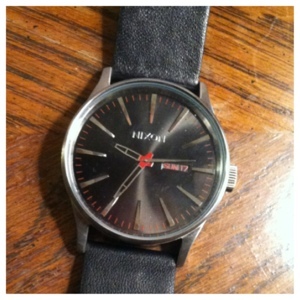 I got husband this watch. He loved it! He's a watch guy (not that he currently has a collection - gives me present ideas for the foreseeable future!) so there was a lot of pressure. 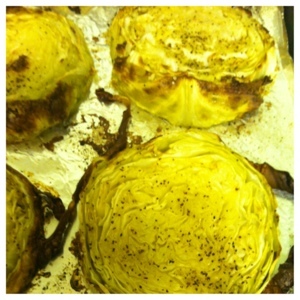 Made some cooked cabbage - this is awesome! Oven at 400, olive oil, any spices you want (I did just salt and pepper), bake for 40 minutes. This was the first time I made it, so we didn't know how it'd turn it, but we ended up standing at the stove eating the whole thing. 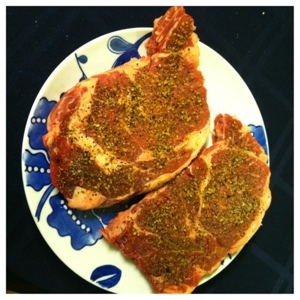 And husband got his steaks. That's all - no sides. Just meat. And we ended off with birthday cake shakes (because I was working a conference all week and didn't get ingredients for French silk pie - his favorite. Course, I've never made it, so I probably would've messed it up anyways). It's ice cream, some yellow cake mix and milk. 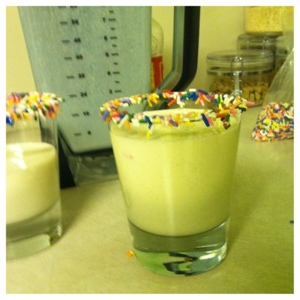 I got the sprinkles to stay on the cups with corn syrup. I lite a match for husband to blow out. Today it was just us and tomorrow were bowling with all his friends. We're not rolling in the dough, but I think he felt special today. Isn't that what's it about?